Bloomberg Businessweek threw a few litres of petrol on the blazing climate-change debate with this week's cover story, less-than-subtly entitled: "It's Global Warming, Stupid." "Yes, yes, it's unsophisticated to blame any given storm on climate change," the article begins, quite correctly. "Men and women in white lab coats tell us – and they're right – that many factors contribute to each severe weather episode." The next line, however, is more acusatory. "Climate deniers exploit scientific complexity to avoid any discussion at all," it reads. The article goes on to argue for the credibility of this week's cover, citing an online comment from the director of the University of Minnesota's Institute on the Environment, Jonathan Foley, who tweeted in abbreviated twitterese, "Re: Sandy. 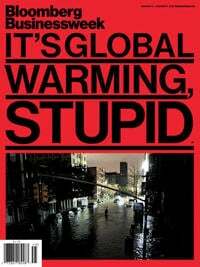 Would this kind of storm happen w/o climate chg? Yes, fueled by many factors. Is storm stronger bc of climate chg? Yes." As one of the climate change–induced effects that the article cites is the fact that Sandy collided with a mass of cold air streaming down from Canada due to a blocking high above the Arctic Ocean, which instensified the hurricane. That high pressure zone, as argued by climate scientists Charles Greene and Bruce Monger in an article earlier this year in the journal Oceanography, has been exacerbated by the well-documented increase in Arctic ice melt, which has as one result a weakening of the Polar Vortex. As Greene and Monger explain, "A weakened Polar Vortex is less able to constrain the cold Arctic air masses, with their elevated moisture contents, from spilling out into the middle latitudes and delivering severe outbreaks of cold weather and snowfall to certain regions." Which is just what Sandy ran into, to the peril of the northeastern US states. Although the article rightly points out that weather is not climate, something is clearly going on globally: the number of severe weather occurances is increasing. An article released this March entitled "A decade of weather extremes" studied, well, a decade of weather extremes, and came to the conclusion: "That such outliers are mere freak events, so called black swans, is a possibility. However, the recent clustering of outliers makes this seem highly unlikely." Eric Pooley of the Environmental Defense Fund explains the increase in severe weather with an analogy featuring the now-disgraced ex-slugger from your Reg reporter's beloved San Francisco Giants. "We can't say that steroids caused any one home run by Barry Bonds," he says, "but steroids sure helped him hit more and hit them farther. Now we have weather on steroids." And then there's the NASA report that came to the conclusion about the recent heat waves: that there is "... virtually no explanation other than climate change." While Bloomberg Businessweek's article attempted to remain even-handed in its arguments concerning the need to take climate change seriously, its editor, Josh Tyrangiel, attempted no such subtlety in his opinion of global warming skeptics. "Our cover story this week may generate controversy," he tweeted, "but only among the stupid."